The web program updates will be made by week's end. The Flash Code Web Program has been updated! The 2019 Q1 program update on CD is shipping now! Our Web Platform will be updated before the end of 2018. Flash Code 2018 Q4 updates are available and shipping! The download version is available here as well. Flash Code 2018 Q3 Desktop update is shipping! The download version is available here as well. This new version includes a mid-cycle quarter update to the LCD and NCD polices and some CPT Code changes. Our web platform has also been updated with these changes. Flash Code 2018 Q2 fees are also reflective of this new AR fee update. The Flash Code 2018 Q2 desktop CD program update is shipping. The download version is available here as well. Flash Code "2018 Q1d" download is available. This "d" version fixes an issue with incorrect fees being displayed when preferences are set in the GPCI Practice Location to view National Avergae Fees. Flash Code "2018 Q1c" download is available. This "c" version fixes an issue with ASA Alternate codes displaying two of the same codes. Flash Code "2018 Q1b" download is available. This "b" version fixes an issue that blocked New Anesthesia crosswalk codes from being displayed in the crosswalk list for the CPT Surgical codes. Flash Code "2018 Q1a" download is available. This "a" version corrects truncated code descriptions within Deleted 2018 CPT and HCPCS Codes. Flash Code Web Program has been updated to reflect 2018 Q1 changes! Flash Code 2018 Q1 Desktop program is available! The program on CD is shipping now. Flash Code 2017 Q4 Desktop program is available! Flash Code Web Program Updates will be applied before October 1, 2017. Flash Code 2017 Q3 Desktop program is available! Flash Code Web Program has been updated as of July 1, 2017. Flash Code 2017 Q2 Desktop program is available! Flash Code Web Program Updates will be applied by the end of the week. A Reminder: Flash Code Legacy WEB program will not be updated and will be sunset and replaced by Flash Code NextGen on April 1, 2017. IMPORTANT ALERT: Flash Code Legacy was Updated for the last time and will be replaced by Flash Code NextGen on April 1st, 2017. Click here for more details. Flash Code NextGeneration WEB program has been updated to contain the latest 2017 Q1 Updates. -Flash Code 2017 Q1 Desktop Download is available. Click here to download it. -Flash Code 2017 Q1 Desktop program on CD has shipped. Flash Code Web Program Updates will be applied before the new year. -Flash Code 2016 Q4 Desktop Download is available. Click here to download it. -Flash Code 2016 Q4 Desktop program on CD has shipped. This update includes more than 3,000 changes and revisions to ICD-10, updates to fees and compliance regulations effective October 1, 2016. -We are happy to announce both of our Flash Code Next Generation Web and Desktop Programs now contain over 1 million links between ICD-10-CM and CPT/HCPCS codes. This data was compiled from over 255 million claims paid by CMS that were ICD-9-CM based. The ICD-9-CM codes were then passed through the GEM tables in forward and reverse direction and the most commonly used codes selected for the link file. We will add to this list of links as ICD-10-CM claims data becomes available from CMS. Click on the LINK button within ICD-10 or CPT Code records to view these links. -The Medicare fee support features that include Status, Global Period, RVUs & Calculations, Modifier Use Guidelines and Surgical Breakout has been implemented to our Flash Code NextGeneration WEB program. These feature can be found on both the Desktop and Web prgrams. Click on the Fee Amount next to the CPT Code to view this feature. Flash Code NextGeneration WEB program update was completed. -Flash Code 2016 Q3 Destkop program on CD was shipped. -Flash Code 2016 Q3 Legacy WEB program update was completed. Flash Code 2016 Q3 Desktop Download is available. Click here to download it. Flash Code 2016 Q2 updates to Flash Code Legacy and Flash Code NextGeneration WEB programs were completed by start of morning on 4/1/2016. Flash Code 2016 Q2 Desktop product is available now and incude updates to codes, fees, and compliance regulations effective April 1, 2016. Flash Code desktop has been updated with the mid-January release of RBRVS data. This file was released by CMS in order to make an adjustment to the converstion factor and to make additional changes to RVU values. These changes are reflected in the 2016 Q1.2 version of Flash Code. Please click the Downloads Page to access links for Macintosh and Windows. Over 1 million CPT/HCPCS to ICD-10-CM links. May 5, 2015	-	Flash Code has been updated (again) for 2015 Q2! updated RBRVS files in hand, we began preparing all versions of Flash Code 2015 Q2 for deployment. On April 14, 2015, the Medicare Access and CHIP Reauthorization Act of 2015 (MACRA) passed the Senate by an overwhelming vote of 92-8. President Obama officially signed the H.R. 2 bill into law on 4/16/2015. This repeals the SGR and prevents the 21% pay cut. -Medicare payments will increase by 0.5% on July 1, 2015 followed by a 0.5% annual increase from 2016-2019. -In 2020-2025, Medicare payments will receive a 0.0% adjustment. -In 2026 there will be one of two conversion factors: a 0.75% rate increase for practices involved in an alternative payment model (APM) and a 0.25% rate increase for provides not involved in an APM. March 30, 2015 - The current ‘docfix’ expires on March 31st and a 21% cut in Medicare payments to physicians is scheduled to take effect April 1st. However, Congress passed a permanent ‘docfix’ via House Resolution 2, but the Senate left for their 2 week vacation without passing it. They are expected to address this issue April 13th, upon their return. The President has expressed support for this bill and has indicated he will sign it into law once it is passes the Senate. We will not update our web servers to reflect the 21% pay cut, unless the SGR fix does not pass and CMS advises its fiscal intermediaries to process claims under that fee schedule. Additionally, we will hold shipments of desktop product until the outcome of this legislation is determined. Please contact us at 800.711.7873 with any further questions. CMS posted a new file this week, which contains a change to the Anesthesia conversion factor. A patch for our desktop program has been posted. Desktop subscribers please visit our Downloads page to install this patch. The Flash Code Provider & Anesthesia programs have been updated to correct errors present in the original CMS RVU file (Medicare Physician Fee Schedule). The corrected files were posted by CMS on 12/30/2014, which did not provide enough time for Fiscal Intermediaries to update their systems for 2015. As a result, CMS has instructed claims processing to commence on January 15, 2015. "MACs will be holding claims for the first 14 calendar days of January 2015. This is due to implement a correction due to technical errors in the Medicare Physician Fee Schedule files including the RVU15A. The current RVU15A posted on CMS.gov is the corrected and most current file." As of this posting Flash Code contains the current Medicare Physician Fees. If you are a WEB subscriber, the changes are reflected. a patch for this file has been posted on our Downloads page. Please download the patch so that the current fees will be displayed in your Flash Code 2015 Q1 update. If you are a DESKTOP DOWNLOAD subscriber and have already downloaded your 2015 Q1 program prior to January 8, 2015, a patch for this file has been posted on our Downloads page. January 6, 2015 - Happy New Year! 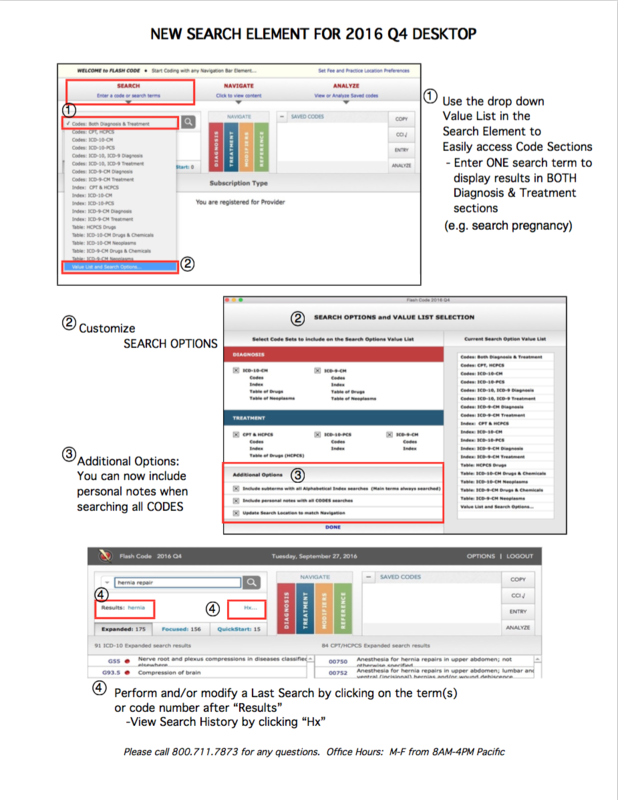 All versions of the Flash Code DESKTOP product for 2015 Q1 have been shipped. Our Flash Code WEB product was updated with 2015 Q1 data on January 1, 2015. -2015 Q1 RBRVS Medicare fee schedule including "Doc Fix extension"
The internet security community has discovered a security breach when Internet Explorer 6.0 uses SSL 3.0 to access secure sites, such as Flash Code. 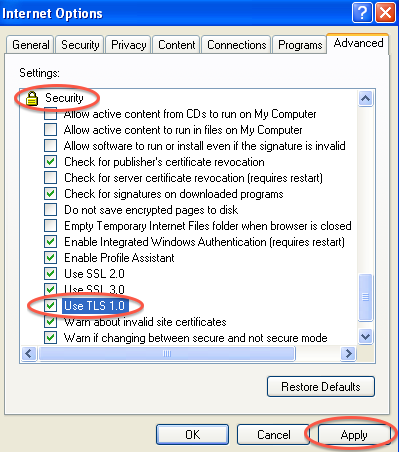 To continue to use Flash Code in Internet Explorer 6.0 securely, the following steps must be taken. 1. In your internet browser click on the Tools menu on the top of the screen and select Internet Options… from the drop down list. 2. Click on the Advanced tab and under settings, security, scroll down to Use TLS 1.0 and checkmark the box. 4. Click Refresh to load the Flash Code site. These settings will eliminate the security threat and allow normal access to Flash Code. *For Tech Support please call 1.800.711.7873 or e-mail techsupport@flashcode.com. As required by law, President Obama issued a sequestration order on March 1, 2013 requiring across- the-board reductions in Federal spending. In general, Medicare FFS claims with dates-of-service or dates-of-discharge on or after April 1, 2013, will incur a 2 percent reduction in Medicare payments. Therefore, to prevent making overpayments, interim and pass-through payments related to the Medicare cost report will be reduced by 2 percent. Beginning April 1, 2013 the 2 percent reduction will be applied to Periodic Interim Payments (PIP), Critical Access Hospital (CAH) and Cancer Hospital interim payments, and pass-through payments for Graduate Medical Education, Organ Acquisition, and Medicare Bad Debts. Questions about reimbursement should be directed to your Medicare Administrative Contractor." The fees displayed in Flash Code are calculated from the current Medicare Physician Fee Schedule. Per CMS the 2% sequestration deduction occurs AFTER the claim is submitted to the fiscal intermediary. 2) If you deduct the 2% sequestration amount prior to billing, the fiscal intermediary will STILL deduct an additional 2%. That means you will receive ~4% less than the Medicare Allowable amount. We will continue to provide information on this matter as it becomes available to us. Below is a link to an article on the Medicare website about “Sequestration”. October 4, 2014 - Our Flash Code WEB product was updated with Q4 data on October 4, 2014. -2014 Q4 RBRVS medicare fee schedule including "Doc Fix extension"
September 24, 2014 - All versions of the Flash Code DESKTOP product for 2014 Q4 were shipped. August 4, 2014 - CMS updated their DME fees on July 28, 2014. This update has an effective date retro back to 4/1/2014. Once we were made aware of this change, we quickly worked on getting the new DME Fee Table implemented into our Flash Code 2014 Q3 program. On 7/31/2014 a patch for our desktop program was posted. Desktop subscribers please visit our Downloads page to install this patch. On 8/1/2014 this update was made to our web program. Web subscribers can now view the most current DME fees within their online program. July 22, 2014 - Our Flash Code WEB product was updated with Q3 data on July 1, 2014. This update included the RBRVS Medicare fee schedule including the "Doc Fix extension", NCCI (unbundling) edits version 20.2, NCD and LCD Medical Necessity edits to July 2014, Medicare Part B drug fees and the LAB and DME tables. Flash Code DESKTOP product was shipped on 6/26/14. April 30, 2014 - As you may know, Legislation enacted at the end of March extends the "Doc Fix" originally voted in Dec. 2013. The H.R. 4302 Protecting Access to Medicare Act of 2014 (The SGR or "Doc Fix" bill) prevents the 20% cuts to the Medicare Physician Fee Schedule. This bill also included a provision that delays the implementation of ICD-10-CM/PCS by one year. It is now scheduled to take effect on October 1, 2015. Flash Code Provider Web product was updated on April 18, 2014 with this "Doc Fix". Flash Code Provider Desktop product was shipped prior to the "Doc Fix". We have posted a patch on our Downloads page to update this file. Your should install this patch if you rely on RBRVS or DME Fees. January 23, 2014 - As of mid-January CMS has released a new file containing updated Anesthesia conversion factors for the several states. Click here to see if your state is affected. All of our Flash Code 2014 Q1 installers have been updated to include the new conversion factors for our Anesthesia product. A patch for this file has been posted on our Downloads page. January 3, 2014 - Happy New Year! All versions of Flash Code contain the 2014 Q1 updates, including Medicare’s “doc fix” as posted by CMS on 12/30/2013. The Pathway for the SGR Reform Act of 2013 prevented the scheduled 20.1% cut in physician pay and has provided a “doc fix” for three months, setting the conversion factor to $35.8228 through March 31, 2014. The 2014 budget was signed by the House and Senate in the week ending 12/20/2013. It was then passed to the President who signed it into law on 12/26/2013. CMS posted the updated RBRVS files on 12/30/2013. Our Flash Code team - comprised of customer support, coding, data and IT specialists worked diligently and quickly to test and implement the updated 2014 Medicare Physician Fee Schedule so that our customers would have acces to up-to-date information at the start of the new coding year. Our goal is to provide the best support and service to each of our customers. January 5th, 2012 - On Tuesday, January 3rd, CMS posted the updated RBRVS fee table that was signed into law on December 23rd, 2011. This fee table contains a 60 day "fix" that stops the 27% pay reduction for medicare Part B provider services. This fee table has been incorporated into all applicable versions of desktop Flash Code (PROVIDER and Anesthesia) and we anticipate all shipments will be sent by Tuesday, January 10th. Web product will be updated on or before Sunday, January 8th. For desktop users who need access to the 2012 CPT and HCPS codes immediately, please go to the Downloads page where the 2012 Q1 installers are now available. December 30th, 2011 - We will be shipping the desktop version of Flash Code 2012 Q1 as soon as CMS releases the updated RBRVS fee table that was signed into law on December 23rd, 2011. This fee table contains a 60 day "fix" that averts the 27% pay reduction for medicare Part B provider services. This affects Flash Code DESKTOP PROVIDER and ANESTHESIA product users only. (PAYER product has already shipped). Access will be available until one week after all affected desktop subscriber product has been shipped. April 1st, 2011 - Flash Code web now contains the Medicare Part B Drug code fees. These fees are released quarterly by CMS and apply Nationally. Examples include: 90655 Flu vaccine $14.86. March 31st, 2011 - The desktop version of Flash Code for 2011 Q2, with codes, fees, and compliance regulations are available for immediate download. December 30th, 2010 - The desktop version of Flash Code for 2011 Q1, with codes, fees, and compliance regulations are available for immediate download. December 9th, 2010 - The House and Senate have passed a medicare pay fix that eliminates the pending 25% pay cut through calendar year 2011. December 2nd, 2010 - The House also passes one month Medicare Pay Fix, the Physician Payment and Therapy Relief Act of 2010 (H.R. 5712) which is signed into law by the President. November 19th, 2010 - Senate Passes one month Medicare Pay Fix. Next step is House action, expected after the Thanksgiving recess.